This is a very luxe wishlist and although I want to try each and every product here, it'll most likely be over a very long time. Oh how I wish I could just buy them all right now in one order! Instead when I need to buy a new salt spray or hair oil then I'll be picking one from this list. Oribe Split End Seal | £42 // Now I know nothing works as well on split ends than a good trim but still want to try this one. 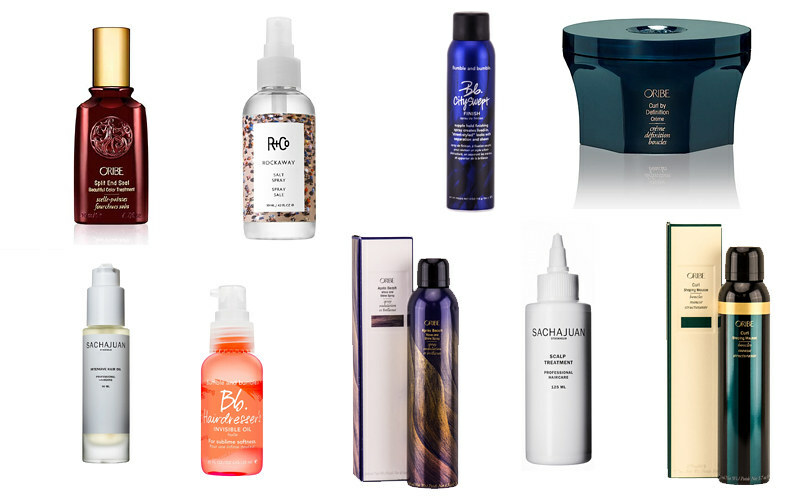 R + Co Rockaway Salt Spray | £23 // I love trying new salt sprays and I love R + Co's packaging. Bumble And Bumble City Swept | £22 // I intend to use this similar to Oribe Dry Texturising Spray after curling my hair with tongs. I find the Oribe version leaves my hair feeling a bit too sticky and have heard good things about City Swept. Oribe Curl By Definition | £45 // This is an expensive one but I can imagine you'll only need to use a small amount and you get quite a lot for of product for the price. I struggle with finding curling products that work without leaving the hair feeling sticky or crunchy and I like to try everything at least once. Sachajuan Intensive Hair Oil | £35 £17.50 // This was already sold out when I was browsing the Space NK sale but I did manage to pick up the shiner serum for only £10. I've heard rave reviews about the Intensive Hair Oil though and will be keeping an eye on it to see if it comes back into stock. I think Sachajuan have changed the packaging and might be why a lot of the products were in the sale. Bumble And Bumble Hairdressers Invisible Oil | £32 // I already have the mini shampoo, conditioner and primer so I feel like I need the oil to complete the set. I love the hairdressers range scent and I can imagine this oil is going to be really nice for adding moisture back into the hair but without weighing it down. Oribe Apres Beach | £34 // I feel like this is a salt spray in aerosol form. It's described as a light-hold, beach-inspired styling spray that creates naturally beautiful waves while delivering moisture and shine. Sachajuan Scalp Treatment | £30 £15 // This is another one from the Space NK sale and again was unfortunately sold out when I discovered it half price. I'm still including it in my wishlist as I'm hoping it'll come back into stock at some point and I'd buy it even if it was full price. Sachajuan is a brand I have fallen in love with and I've liked every product I've tried so far. Oribe Curl Shaping Mousse | £35 // There's only a few curling mousses that I like and although expensive, I'm thinking this will be another one that I love. perhaps you should check your articles prior to posting.